I'm excited to be attending (and presenting at!) two of the largest museum conferences in the U.S. at the beginning of May. 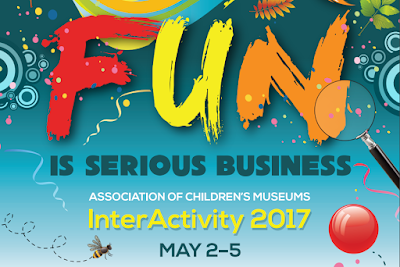 This year the Association of Children's Museums (ACM) and the American Alliance of Museums (AAM) conferences are scheduled to happen nearly back-to-back with ACM's InterActivity Conference up first in Pasadena, and the AAM's Annual Meeting & Museum Expo following right after that in St. Louis. InterActivity in promises to be a fun and action-packed meeting with Kidspace Children's Museum being the host venue. In addition to all the other exciting sessions, I'm especially looking forward to sharing co-emcee duties with Margaret Middleton for the "Sound Bites" evening event on Wednesday, May 3rd from 7:30 to 9:00 PM in Ballroom A. If you aren't able to attend InterActivity in person this year, keep track of the hashtag #IA17 on Social Media, and check out my own Twitter (@museum_exhibits) and Facebook feeds as I will be providing live updates and pictures throughout the InterActivity conference. Then on to St. Louis, the home to one of my very favorite museums, The City Museum! on Tuesday, May 9th, from 10:30-11:45 AM at 226 America's Center. I'll be joining my fellow speakers to present five different perspectives on key trends that are challenging and changing the way we design museum exhibitions. I'll be covering phygital museum experiences (physical/digital mashups) for my part of the session. The second session I'm involved in during the AAM Conference is entitled How to Suspend Disbelief: Lessons Learned through Pop-Ups. The session happens on Wednesday, May 10 from 11:15 AM -12:30 PM at 130 America's Center. For my part, I'll be talking about how I used pop-up museum techniques during my recent trip to Tunisia, and the lessons I took away from that experience. If you can't attend the AAM Conference this time around, follow the ubiquitous #AAM2017 hashtag or my Twitter (@museum_exhibits) or Facebook feeds for live updates. I look forward to seeing folks (especially ExhibiTricks readers!) on the conference circuit this spring!